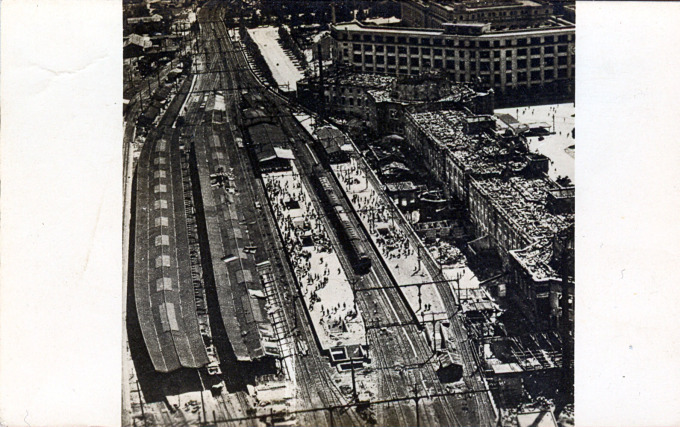 Aerial view of Tokyo Station, 1945. The entire third level of the terminal was destroyed in the May, 1945 firebombing of the capital. 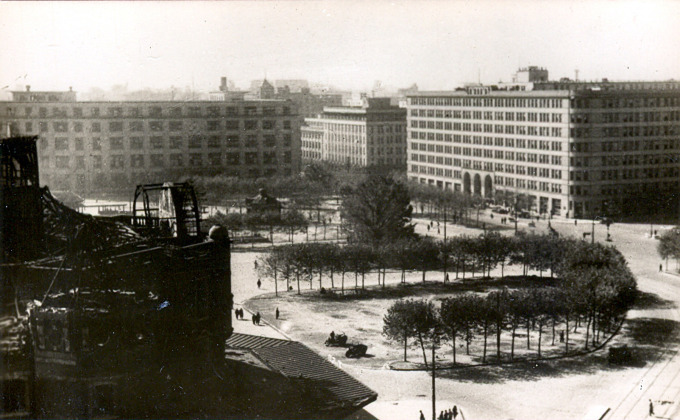 Tokyo Central Station was damaged by the 1923 Great Kanto earthquake but remained standing. The war-time firebombing of Tokyo on May 24, 1945, proved to be completely devastating. Gutted by fire and its third level burned to cinders, the terminal’s post-war reconstruction changed its picturesque profile, resulting in the complete removal of the third level and the replacement of the station’s original ornate cupolas with very plain-looking, polyhedron domes modeled on the Pantheon in Rome. These postwar alterations, although considered “temporary”, are blamed for creating the often mistaken impression that the terminal’s design was based on the central station in Amsterdam, and were not corrected until Tokyo Station underwent a complete rehabilitation. Two restoration projects, beginning in the 1990s and completed in 2012, eventually restored Tokyo Central Station to its pre-war charm and splendor. Elevated view of the damaged terminal (left) looking across the station plaze toward the Marunouchi Building, 1945. 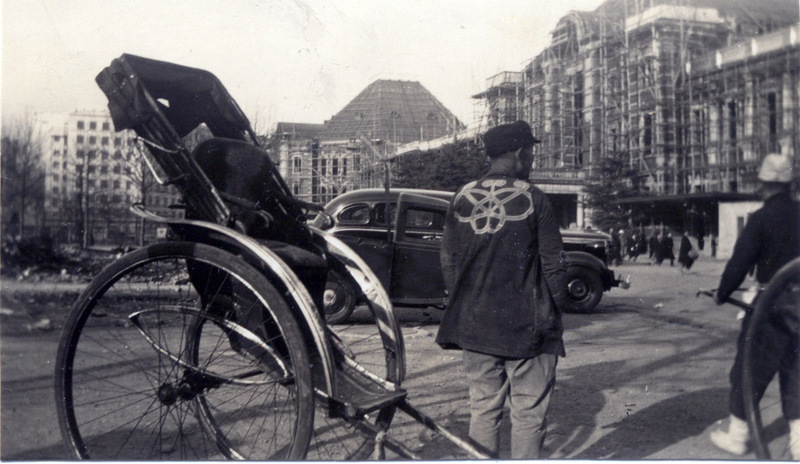 Tokyo Station under reconstruction, 1947. Panorama of the reconstructed Tokyo Station and the station plaza, c. 1955. To the left are the Marunouchi and Shin Marunouchi buildings. 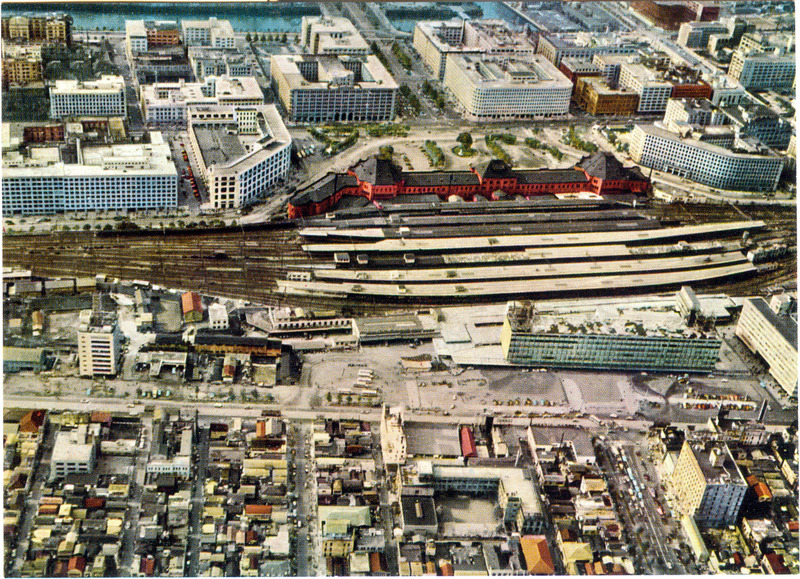 Aerial view of Tokyo Station, c. 1960, from over the Marunouchi business district. At lower-right is the Central Post Office. The terminal first opened in 1914 with four platforms: An electrified pair serving the Yamanote and Keihi-Tohoku lines; and non-electrified pair serving the Tokaido Main Line. When the Chuo express and local rail service was extended to Tokyo Station in 1919, from Kofu, Tachikawa, Ochanomizu and Manseibashi, passengers used the Yamanote platforms. After the opening of the Yaesu (East) entry in 1953, two new platforms for Tokaido Main Line services were added. Two additional platforms opened in 1964 to accommodate the first Shinkansen (New Tokaido) services. Beginning in the late 1960s, extensive underground construction was begun to accommodate additional rail services including the Narita Express. 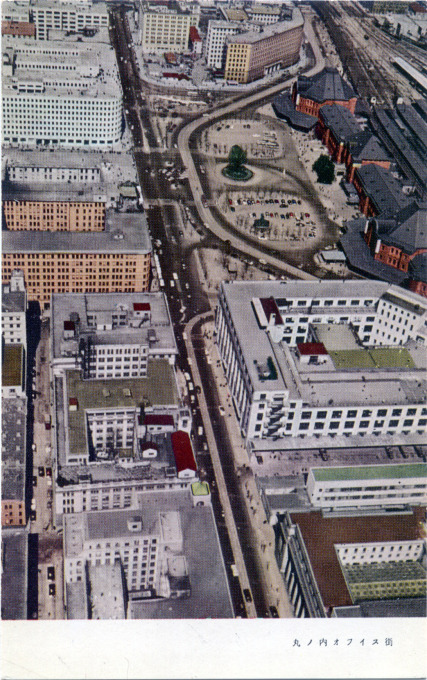 Aerial view of Tokyo Station, c. 1960, depicting the newly-completed Daimaru department store anchoring the Yaesu entry to the terminal.